Pearl Size: 4 to 5’’ MM. Pearl Type: Fresh Water Pearl. These Pearl Beads are composed of calcium carbonate. Price Per String: 400 Rs. We are leading company actively betrothed in offering a broad range of 4-8 No Tyre Pearl Beads that meet on patron’s demand. Usage: Fashion Jewelry,dress, Lighting Accessories, Garment Accessories, etc. 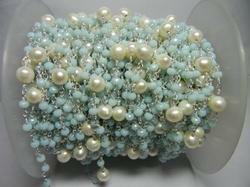 We offer very good quality pearl beads to our customer.